The Hawks are one of the upset winners in softball prelims. FALMOUTH — Joelle Casey hit an RBI triple during a four-run third inning and Gianna Riccardi added a two-run inside-the-park homer in the fourth Tuesday as 11th-seeded Marshwood upset sixth-ranked Falmouth 8-3 in a Western Class A softball prelim. Tuesday was a day of first-round upsets, with Biddeford, Lake Region and Leavitt also falling at home to lower seeds. Emily Robida struck out four in a five-hitter, and Casey finished with two hits and two RBI for the Hawks (6-11). Chelsea Fagan had two hits and drove in a pair of runs for Falmouth (10-7). Riccardi and Meaghan Sandler also had two hits each for Marshwood. GORHAM 12, BIDDEFORD 3: Tenth-ranked Gorham (8-9) scored eight runs in the third inning and defeated the seventh-ranked Tigers (10-8) in a Western Class A prelim at Biddeford. Amber Cavaretta hit a two-run single followed by a two-run double by Noelle DiBiase for Gorham in the third. Lindsey Wilcox then added a two-out, two-run single. FRYEBURG ACADEMY 4, LAKE REGION 2: Amanda Gillette scored on a sacrifice fly by Sydney Charles to break a 2-2 tie in the fifth inning and lift the 10th-seeded Raiders (8-9) over the seventh-ranked Lakers (9-8) in a Western Class B prelim in Naples. Fryeburg took a 1-0 lead in the first when Charles doubled and scored on an error. The Lakers took a 2-1 lead in the third on a two-out, two-run single by Samantha Marucci. OCEANSIDE 6, FOXCROFT ACADEMY 3: Paige Tyler drove in the go-ahead run with a triple in the fifth inning and fifth-seeded Oceanside (12-5) held off 12th-ranked Foxcroft Academy (6-11) in an Eastern Class B prelim at Rockland. After Foxcroft took a 3-0 lead, Trittany Penn tied it with a two-run triple in the fourth. Alexis Davis of Oceanside allowed two hits and six walks, and struck out three. Gabby Johnson hit a two-run double for Foxcroft. POLAND 11, LEAVITT 2: Kylie Martin struck out eight, walked none and gave up six hits as ninth-ranked Poland (9-8) downed eighth-seeded Leavitt (10-7) in a Western Class B prelim at Turner. Kelsey DeBurra had three hits and drove in two runs for Poland. Poland scored four runs in the fourth on a two-run double by Haley Whitworth, a sacrifice fly by DeBurra and an RBI single by Kalor Plummer. 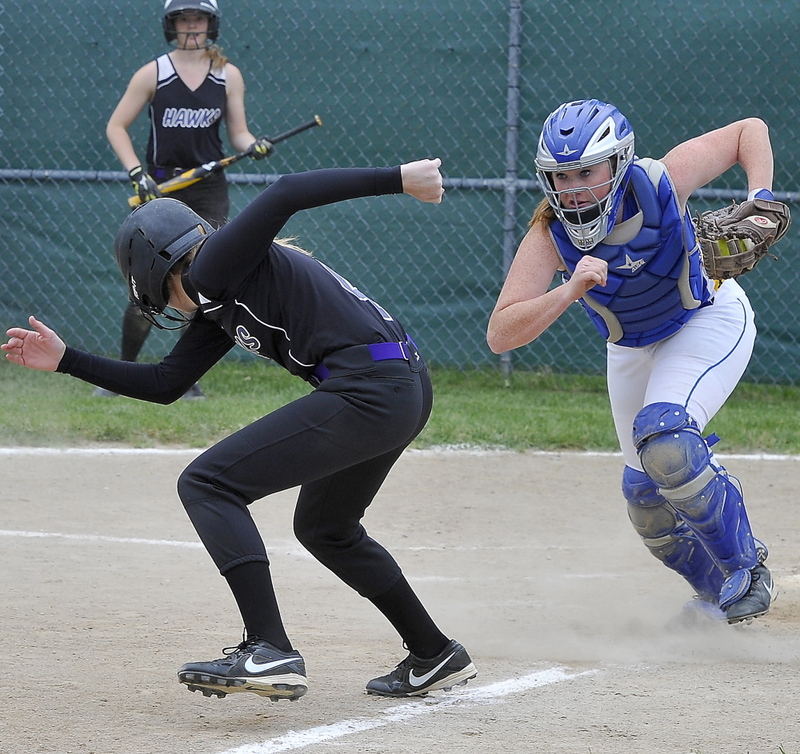 BONNY EAGLE 7, KENNEBUNK 0: Allison Pike struck out nine with no walks in a two-hitter for the fifth-seeded Scots (12-5) against the 12th-ranked Rams (6-11) in a Western Class A prelim at Standish. Breanna Lifland hit three singles for the Scots, including an RBI single to open the scoring during a three-run first inning. Caitlyn Dyer added a two-run single in the first and finished with two hits for the Scots. Lauren Turner reached four times and scored four runs for Bonny Eagle. WINSLOW 10, MEDOMAK VALLEY 3: Winning pitcher Hannah Doble had two doubles and five RBI, and Jenna Petrovic singled, doubled and drove in a run as the sixth-seeded Black Raiders (12-5) defeated the 12th-ranked Panthers (6-11) in an Eastern B prelim at Winslow. Hillary Libby collected two hits and scored twice for Winslow. Vanessa Rancourt had a single and an RBI for the Panthers. MONMOUTH ACADEMY 7, LISBON 4: Sabrina Beck hit a two-run homer in the second inning to help the seventh-seeded Mustangs (11-6) top the 10th-ranked Greyhounds (6-11) in a Western C prelim at Monmouth. Monmouth will play second-seeded Hall-Dale in a quarterfinal Thursday at Farmingdale. HAMPDEN ACADEMY 10, MT. BLUE 6: After falling behind 10-1, the ninth-seeded Cougars (7-10) scored five runs in the final two innings but it wasn’t enough as the eighth-ranked Broncos (8-9) won the Eastern Class A prelim at Hampden. Lauren Guppy led the Cougars with two singles, an RBI and a run, and Kiana Thompson had two runs and three stolen bases. Abby Lord and Courtney Dunton paced Hampden with two singles each. The Broncos advanced to play top-ranked Cony in the quarterfinals at 6 p.m. Thursday at Augusta. NOKOMIS 13, BELFAST 1: The fourth-seeded Warriors had no problem winning an Eastern Class B prelim at Newport, defeating 13th-ranked Belfast (6-12) in five innings. Mikayla Charters had a double and a triple, and Becky Orcutt, Courtney Carlson, Libby Dunivan and Shannon Kasprzak each finished with a pair of singles for Nokomis, which will play Thursday at fifth-seeded Oceanside (11-5) in the quarterfinals. PRESQUE ISLE 10, ERSKINE ACADEMY 3: The eighth-seeded Wildcats (8-9) scored six runs in the first inning and went on to defeat ninth-ranked Erskine Academy (7-10) in an Eastern Class B prelim at Presque Isle. Taylor Boucher led Erskine with a single and a double. Amber Grady, Avery Bond and Taylor McLaggan each added two singles. Presque Isle will play at top-ranked Gardiner in the quarters Thursday. MASSABESIC 12, WESTBROOK 0: Rayne Whitten had four goals and two assists to lead top-ranked Massabesic (12-1) over eighth-seeded Westbrook (7-6) in a Western Class A quarterfinal at Waterboro. Jackie Guillemette added two goals and an assist, and Megan Hill had five saves for Massabesic.